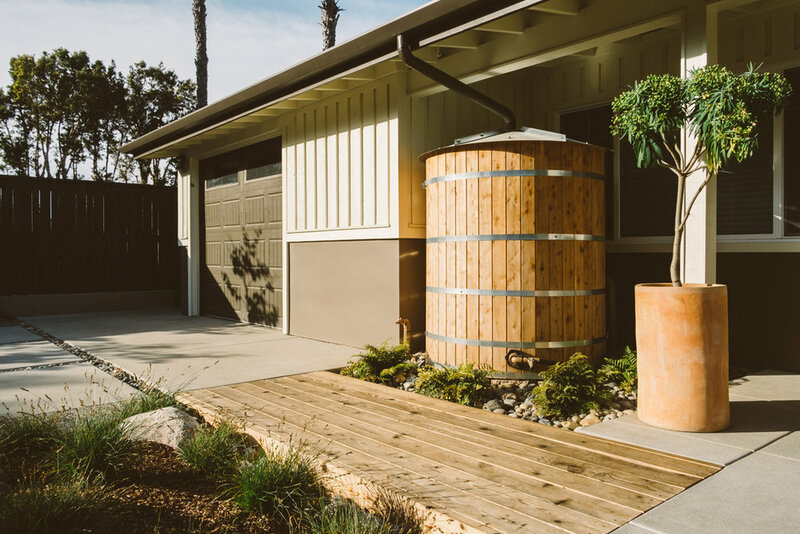 Rainwater harvesting is an easy way to collect water and use it again for your landscape or dishwashing. Not all containers have to be an eye sore either, this one pictured above gives this house a rustic and down-home feel. This is part two of the “You Can Do It Too” blog; in the first part we discussed how implementing pervious materials and planting California natives can aid in created a healthier environment. For this chapter we will discuss how rainwater harvesting and edible gardens can support a sustainable lifestyle as well. One of the most important design techniques that we use in each of our projects is the power of scale. By understanding that scale in patterns, heights, and densities can play a vital role in making a space feel comfortable, we are able to successfully design for any type of project. We love to take inspiration from where we live, and Solana Beach is the perfect creative tap that never stops running. Not only is the style influential, but the people we constantly meet bring new ideas and new ways of thinking to our business. Here at Falling Waters Landscape we call San Diego our home. San Diego is in a rare and unique geographical location because it is surrounded by major cultural hubs that contribute to the blended lifestyle that the city contains. From the North we have Los Angeles, the city of stars, the city of “opportunity,” from the South we have Mexico, a deeper cultural heritage, from the East we have the desert, and from the West we are graced by the ocean. This dynamism gives San Diego its unique charm. Designing towards a cultural significance creates a genius loci: sense/spirit of place. 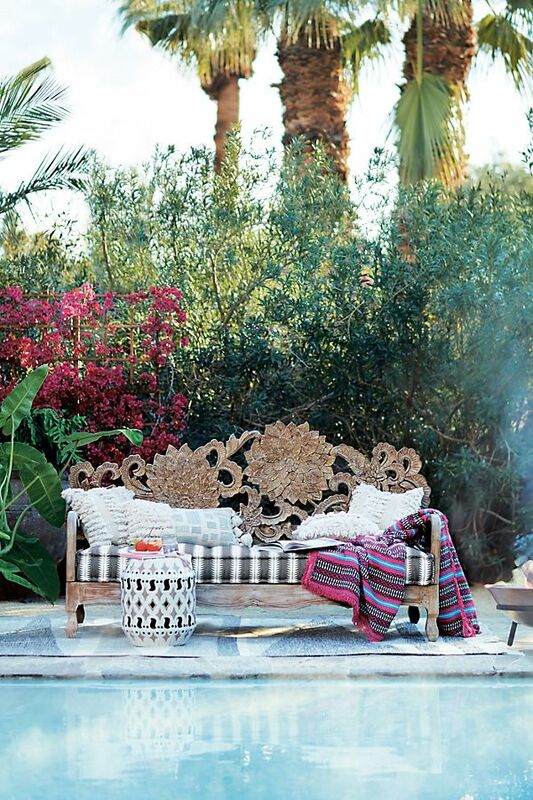 The Southern California style has grabbed the effects of beach, desert, Spanish, and LA’s sophistication to, in my opinion, identify as Bohemian Chic. The term itself is contradictory because it combines “Bohemia”, a casual laid-back frugal style, with “Chic,” a high-end and expensive style, but San Diego has its contradictory tendencies as well (Design Style: Bohemian Chic). This trend has started as early as the 1960s when the hippie was born, but has now evolved into a full blown design style that contributes to much of the build of the San Diego landscape. Intricate design, vibrant colors, and attention to detail encapsulates what this style promotes. In landscape design we have the unique opportunity to display this trend in the plants we choose and the materials that compliment them. It is a comfortable yet put-together style that is inviting and familiar to the community of San Diego. The images below are from the Summer 2018 Anthropology Outdoor Living Collection. This style perfectly reflects the tones and details that are described above. We encourage you to bring this unique style into your own backyard by adding bold colors and rustic undertones that really develop your sense of place in Southern California. Typically creepy crawlers are not invited guests into someone’s home. Most people never want to see them let alone invite them in for afternoon tea. Unfortunately, by having this attitude we have pushed out the local and native animals, taken over their home, and made them pack their bags to find new residence. Most of these animals do not make the commute and slowly dwindle off to extinction. A not so common fact is that the more wildlife in someone’s backyards the healthier it is. I am proposing a cohabitation with the native wildlife to not only increase their well-being, but the homeowners as well. Now, how do we do this Annie? Well let me tell you a few simple steps that can promote a healthy ecosystem right in your backyard. An easy solution that is not only a fan favorite to homeowners but also birds alike, is planting flowers, particularly bright red/yellow ones. Flowers are nature’s built-in targets that draws birds down from the sky above. They will not only find their nutritional needs in these flowers but the birds will aid in pollination. To keep them coming homeowners need to supply a buffet full of berries, fruit, nectar, and water. By including plants with different bloom times you can see a constant flow of birds throughout the year. Some of our favorites that will achieve all of the above are Digitalis, Salvias, Cercis occidentalis, or Lavandula for nectar and Ligustrum, Rhamnus californica, or Berberis for seeds and berries. If this is not possible man-made elements like bird baths or bird feeders are easy to implement in any yard. Humming bird drinking nectar from the California native Salvia spathacea plant. I also highly suggest creating a healthy environment that attracts butterflies, they will bring beauty and movement in your yard, while pollinating plants. The unique attribute of these though is that the environment must be suited for both the caterpillar and butterfly life cycles. Like birds, messy dense areas will be prime areas for the butterfly larvae to cultivate, while bright flowering plants will encourage adult butterflies to stay. Some suggestions are, Achillea millefolium, Rosmarinus officinalis, and Iberus sempervirens. A butterfly drinking nectar from our California native plant: Achillea millefolium. Many other crawlers are great to attract into your landscape. Try including lady bugs to fight off unwanted bugs in the garden or worms to support a nutritious soil to help your landscape prosper. Refer to the link below to see a detailed list of plant species that are perfect to help wildlife thrive. Let’s invite wildlife to visit and stay awhile, the effects are outstanding to both the environment and humans alike. Every year the San Diego Architectural Foundation puts on a fundraising and educational event to bring awareness to the outstanding architecture, planning, and urban design that makes San Diego one of the best places to live. This program engages the community by promoting an interaction between the citizens and their built environment. Read on to see the Landscape Architecture projects that got recognized this year! Would you rather, not have your sense of smell for the rest of your life or not be able to see?.. Well then would you rather not have your sight for the rest of your life or not be able to taste?.. Unless you are a foodie like me, most people value sight above all other senses. It is a security net, a memory receiver, and the main way that we absorb the world around us. The eye’s reception dominates our sensory experience. Visuals control our feelings and moods. We can feel energetic and playful in a crowd full of lights and people or feel peaceful and blissful looking at the waves crash against the shore.